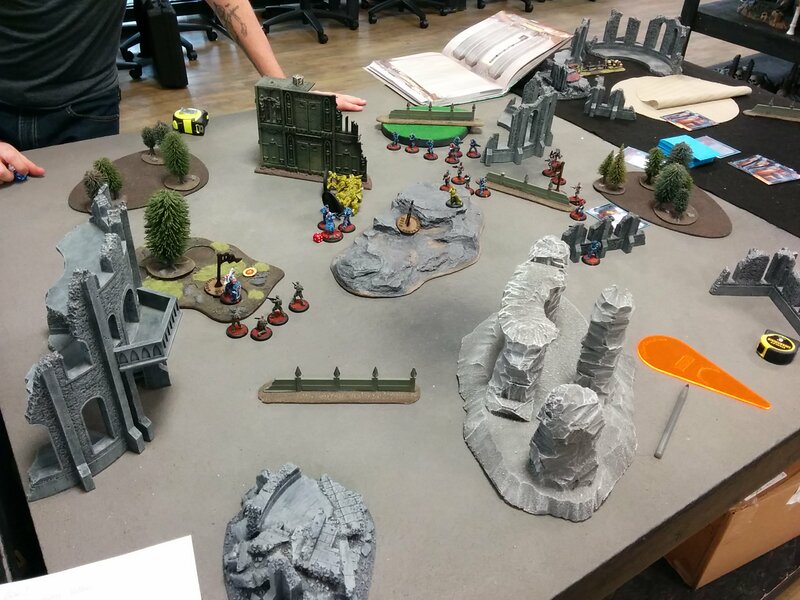 Post subject: 1000 Points Advanced Game, Capitol vs Bauhaus! Uncle Sam's Capitol detachment was spread thinly through the rocky outcroppings of a Venusian wasteland. He'd heard rumors of some communist Bauhaus forces in the area, but hadn't been able to track them down yet. After days spent wandering the wastes, the orders from above finally came! "Sam, get your forces to the following coordinates, and secure the territory! Bauhaus forces are in the area!" "Uhhhh, yeah sure, they're commies! Go get 'em!" We rolled a free for all mission. So my army needs to capture the right-most objective, and the Bauhaus forces are trying to take the center. My secondary mission was to secure the high ground, and my corporate objective was for the heavy infantry squad leader to kill 3 times his points value. Bauhaus on the other hand needed to kill my warlord, and also ensure that the light infantry squad commander died in battle! So, the forces! Numbers were certainly on my side! Onto battle! Starting on the battlefield were my Heavies, Free Marines, and Sea Lions. The rest either failed to show up, or elected to rapid deploy! The heavies took shelter in some ruins on the left, Sea lions hid at the back, and the Free Marines showed up quite far away from the action, but near the objective. 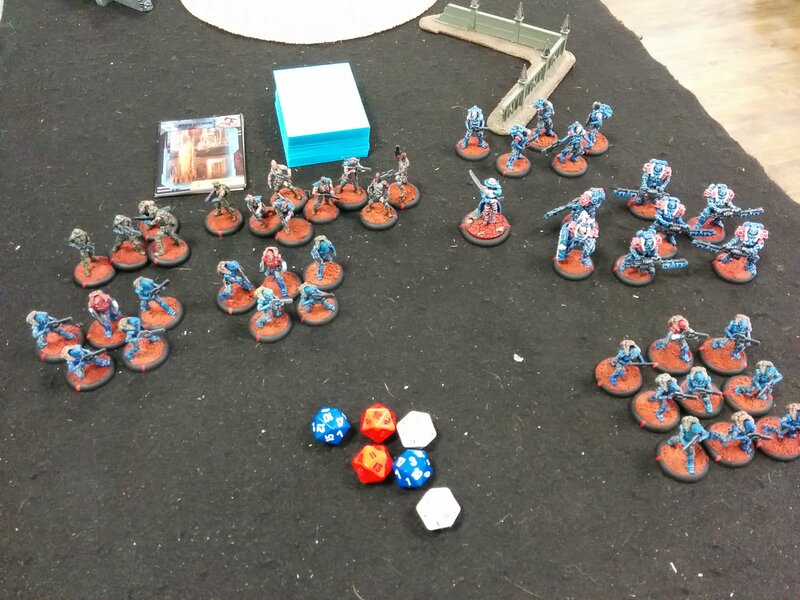 Angelica and her Vulkans started on the board, but both hussar squads were in reserve, and the juggernauts and etoiles were going to be rapid deploying. Turn one starts off with a bang! I play the Iron Union card! 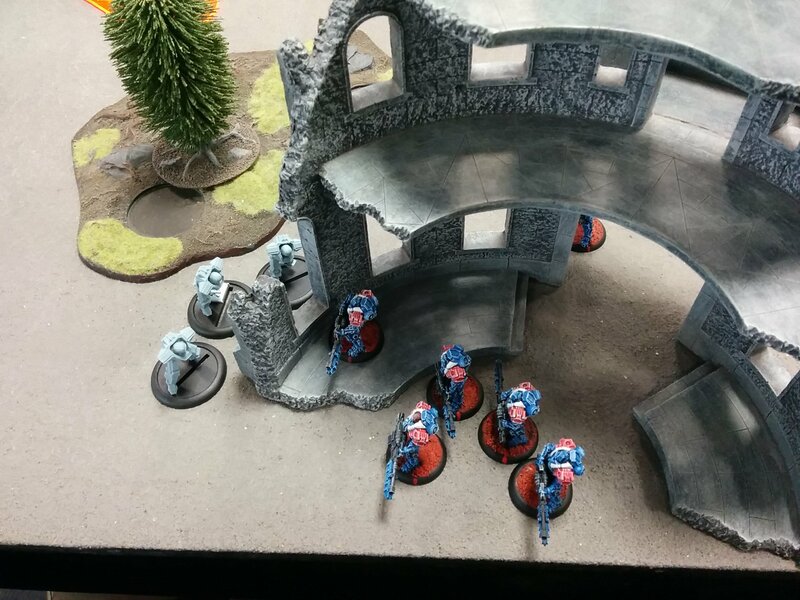 My heavy infantry step to the side to bring the Vulkans into view. Most of the squad burned resources for some extra shots and managed to put a few dinks in the Vulkan's armor. The squad leader, convinced he needed to show the troops what he was made of this game, gleefully fired his autocannon into the Bauhaus mechs. Unfortunately, he quickly learned that going into combat without a helmet isn't a great idea. 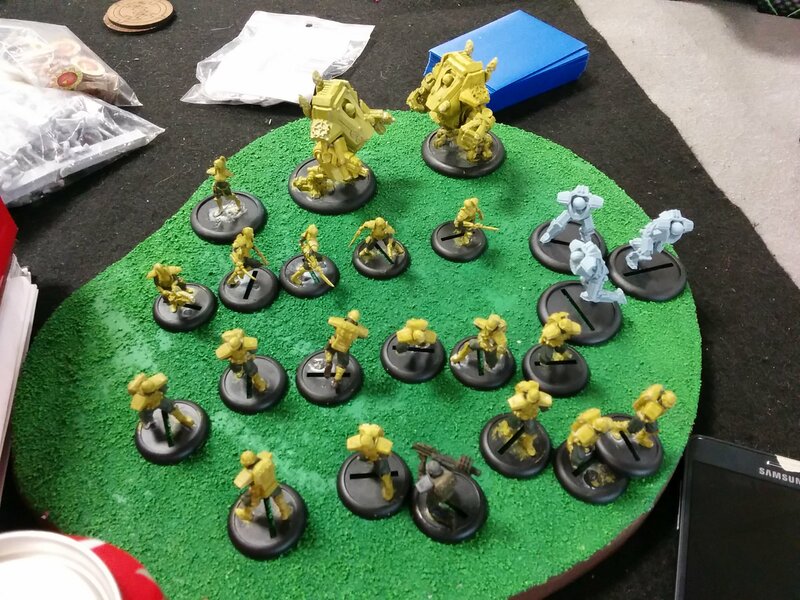 Juggernauts rapid deploy, charge up their double-weapon power, and whoosh! In a huge burst of flame and machine gun bullets, 5 of my heavy infantry are annihilated. Only one trooper and the Iron Lady survive! 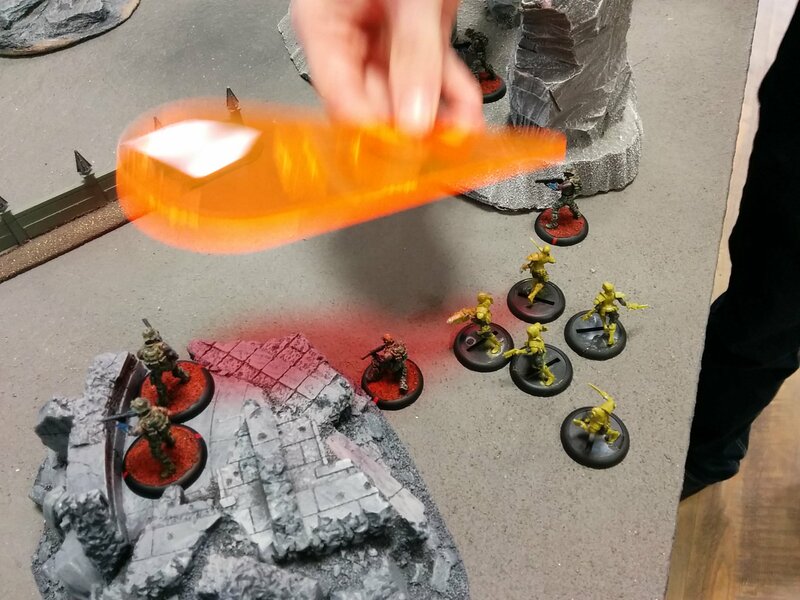 The juggernaut squad leader then burns some cards, and drops a smoke bomb at their feet, so no retribution can be had! Curses! Corporate mission a colossal failure! Whoosh! Some Etoiles appear! I swear, they came from nowhere! The puker hums to life and spits nasty plasma all over 3 of the Sea Lions. However, the Iron Lady's new and improved 9-inch heal reroll range, combined with Iron Union means that only one of them perishes! The Etoile leader throws another smoke bomb at her feet, making retaliation impossible! 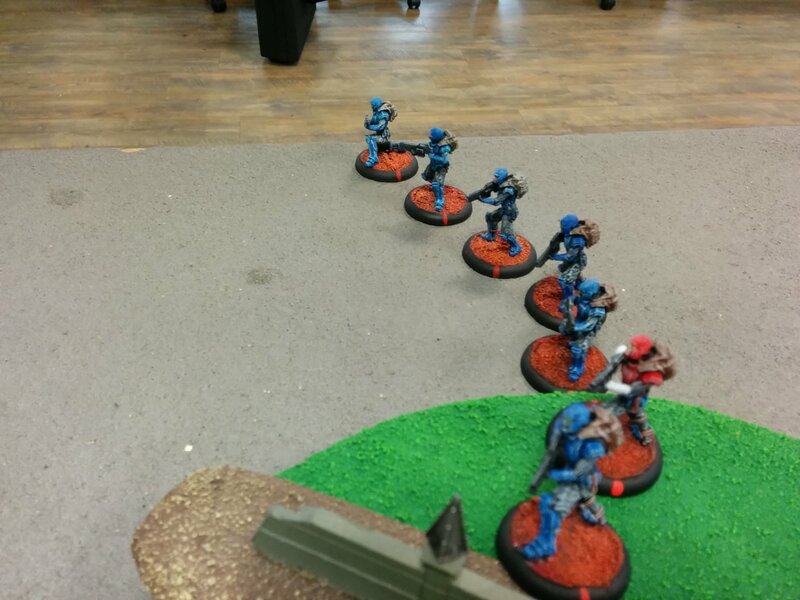 On the other side of the battlefield, the Free Marines advance, taking defensive positions around the objective. I decide to bring some reinforcements onto the board. The banshees scream down from the sky, and scatter off into the corner where they wait for an opportunity to attack. 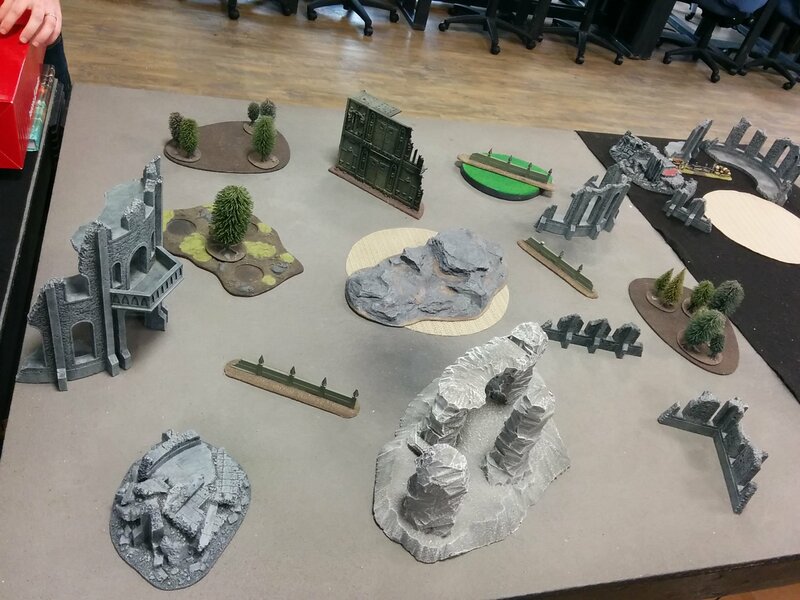 Next, one of the squads of air-cav lands in the middle of the board and takes cover behind some rocks. They equip their handy dandy plasma warheads, as suddenly my only weapons with AVV have already died! Harrumph! Angelica and her Vulkans don't advance too much. 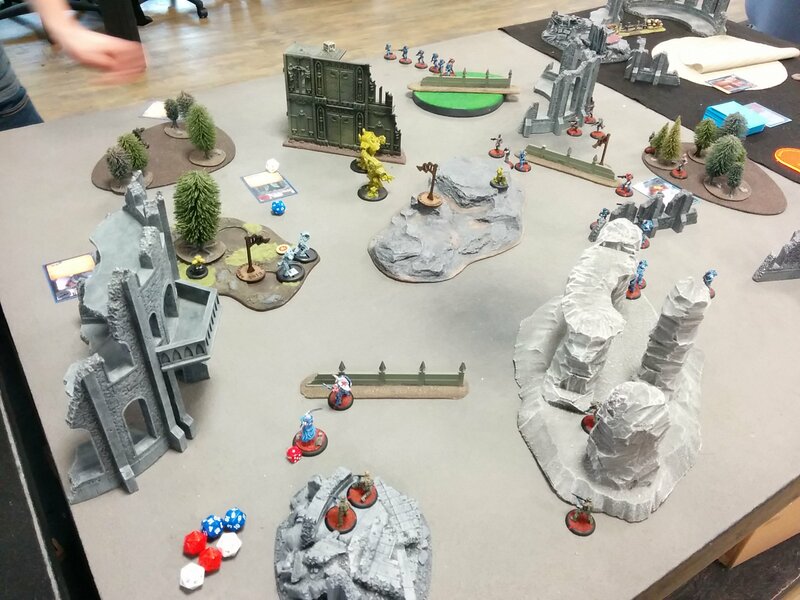 Turn 2 begins with both of our armies showing up. Uncle Sam shows up on the left side, and the light infantry squad show up in the far corner. Both Hussar squads take defensive positions in the Bauhaus side. The turn begins with the Iron lady running forward and roasting the Etoiles. 3 go down! Her last heavy follows and fires into them, but fails to hit anything! The Etoiles respond by turning the Puker on again, but both heavies survive! The other Etoile charges and manages to strike down the last heavy! Only the Iron Lady survives. The Bauhausian army starts advancing. The Vulkans charge forward and drop their smoke bombs, becoming impossible to target. The Sea Lions use their blend in skill and manage to down a juggernaut! Uncle Sam runs towards the Iron Lady, not wanting to get shot to pieces by a whole squad of Hussars. Finally, the other squad of Air Cav show up, landing right next to the furthest Hussar squad, and open fire with their shotguns. Only 1 survives the assault! "Oof! Death is a preferable alternative to communism!" Sam ends up getting shot a bunch, and takes a wound! 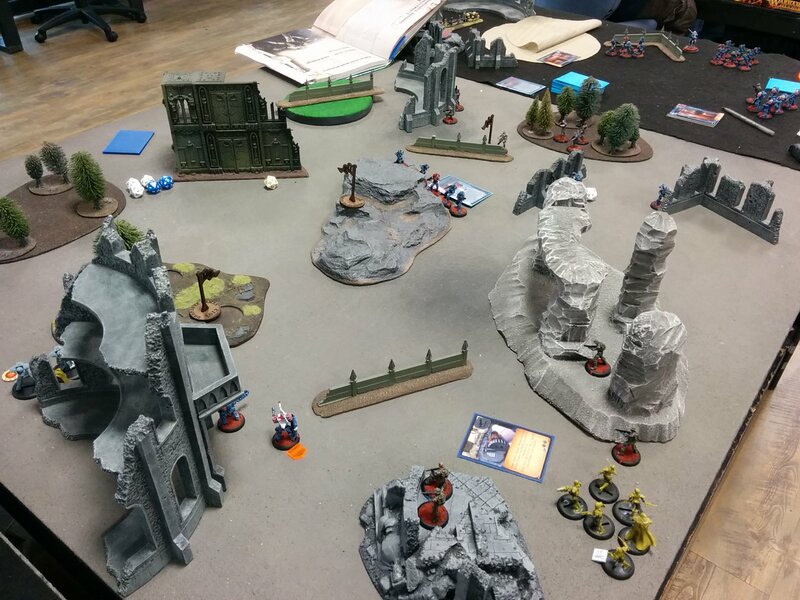 Turn 3 begins and the Bauhaus plays Spiraling Costs! My plasma rockets will cost 4 resources a piece! Ouch! 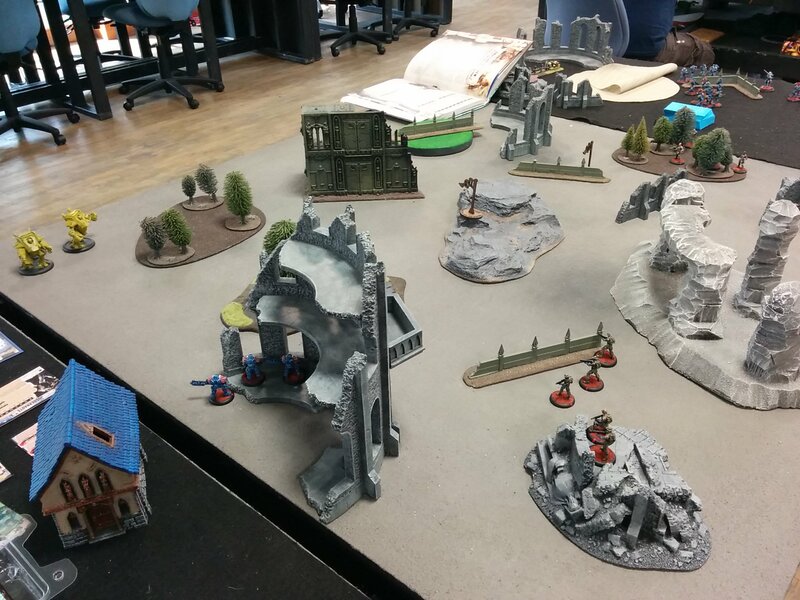 Angelica starts off the round, dropping an EMP device on the air cav in the middle of the board, stopping them from shooting! She then rushes forward, and her crackling whip slaughters the bulk of the Aircav squad next to her! The last man cowers and tries to flee! But he's cut down and dies, leaving Angelica out in the open! Uncle Sam takes another wound from the Hussar squad and charges into battle with the Juggernaut. They both swing at each other but both survive! 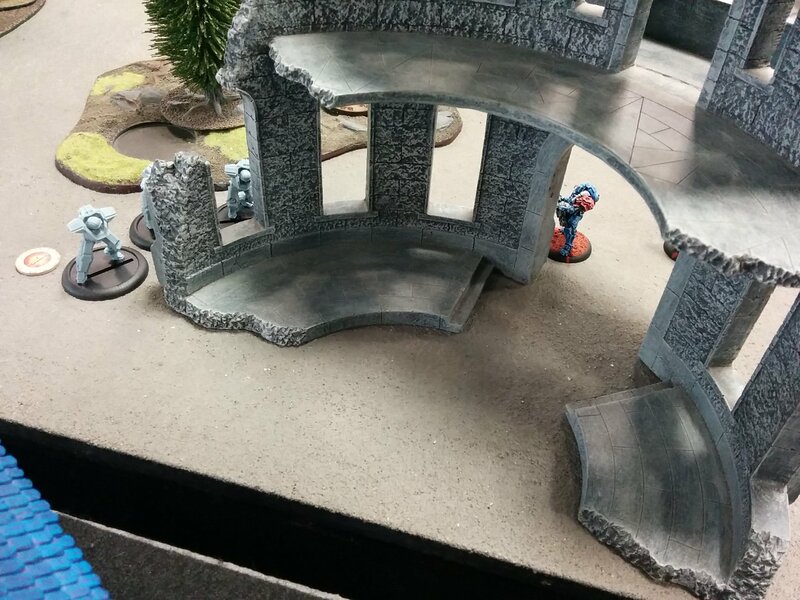 Sea Lions fire at some Hussars, and the rest of my army fires pitifully into the Vulkans. At this point, I have a huge numbers leads, but not much that can harm those Vulkans. However, the real death-blow comes when Angelica is left out in the open. The entire light infantry squad, now consisting of 7 members, issues a focus fire order and guns her down. 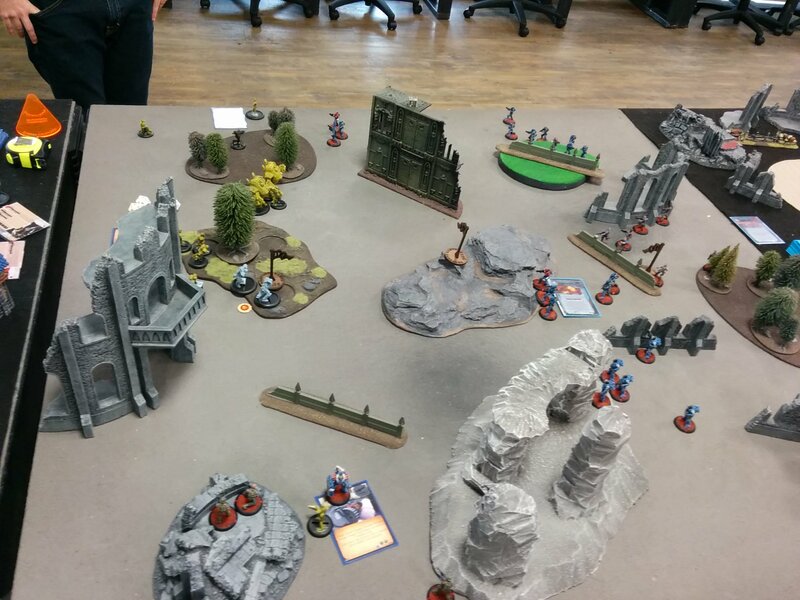 Turn four opens with some plasma rockets taking out the legs of punchy Vulkan. Uncle Sam bellows with rage. He recognizes this Vulkan, as it's the one that killed him in a past life! He must have his revenge personally! The Free Marines throw some C4, the Banshees charge, and pretty much my entire army fires into the Vulkans but still they stand! "Better dead than red, you filthy Commie!" Sam strikes down the last Juggernaut! 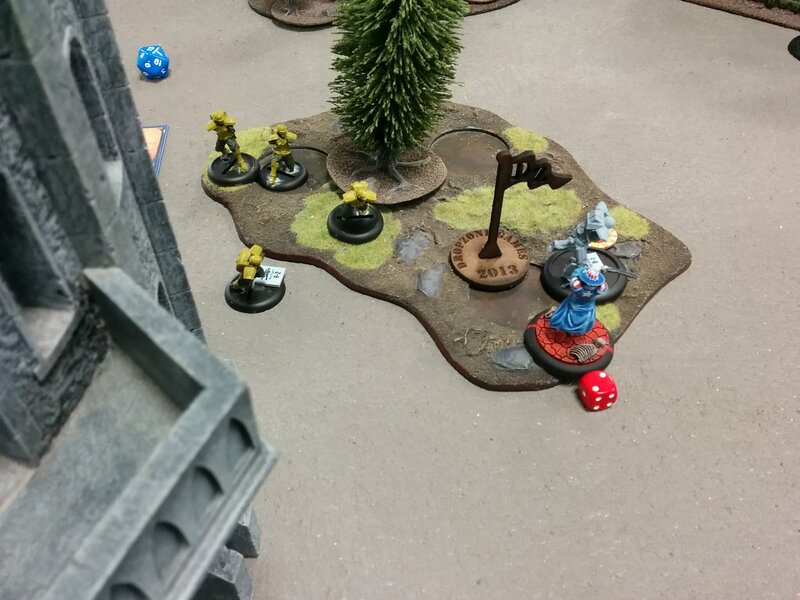 We spend another 2 turns of fruitless shooting into the Vulkans before they finally go down. Sam manages to stab the shooty one to death after it stomps a few Banshees to bits, and eventually the combined fire of most of my army brings down the immobilized punchy-bot. Victory to Capitol! Freedom is the sovereign right of all Capitolians! I really feel like numbers won this for me. Simply having so many bodies on the table is a huge bonus. I still think that Rapid Deployment needs to be tweaked a bit. Both my Air-cav with shotguns, as well as the juggernauts is simply a TON of unavoidable damage that's really hard to react to. Not totally sure how to address that. Either way a fun game! 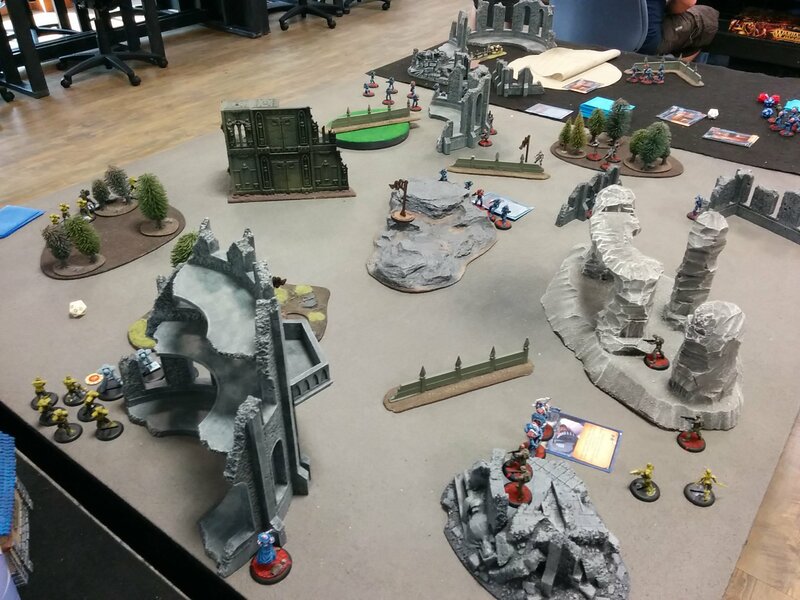 Even though everything I put on the table got knocked out it was still a fun game to play! Can't wait to go another round. Great report. Smoke flares are great. Shotgunning, RD Air Cav are brutal. If you missed it: Tournament rules tone down RD by limiting them. Not sure if that's the best answer (actually I think that's a pretty poor solution to RD, but it's a solution). RD rules are likely to be looked at properly before a true fix comes out. The tourney limits are a temporary thing, IIRC. great write up. I think your Uncle Sam and my Commander Norris would get along wonderfully. In your report, you don't mention the effect of Air Cav's Rocket. They did not do any damage at all ? If I recall correctly I was able to play Spiraling Costs, which made them very expensive for a large portion of the game, but I believe the rockets did take out the legs of the vulkan with the fists. They certainly did work. Spiraling costs made them prohibitively expensive for one round, but they very much helped get rid of the Vulkans. Dullahan's right, I think they immobilized the punchy one and probably put some damage on both.